Tailor made programs planned especially for the individual client. The client’s budget and individual preferences are the basis for the program design. 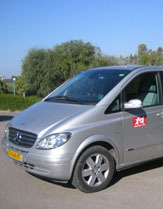 The tour is planned to fit the client’s timetable -special needs and requests. We provide a top professional guide with a luxurious car for the duration of the trip. We book the hotels, transfers, museums, and sites. We arrange for a baby-sitter if needed, book a table at a restaurant, and fulfill special requests the client may have.